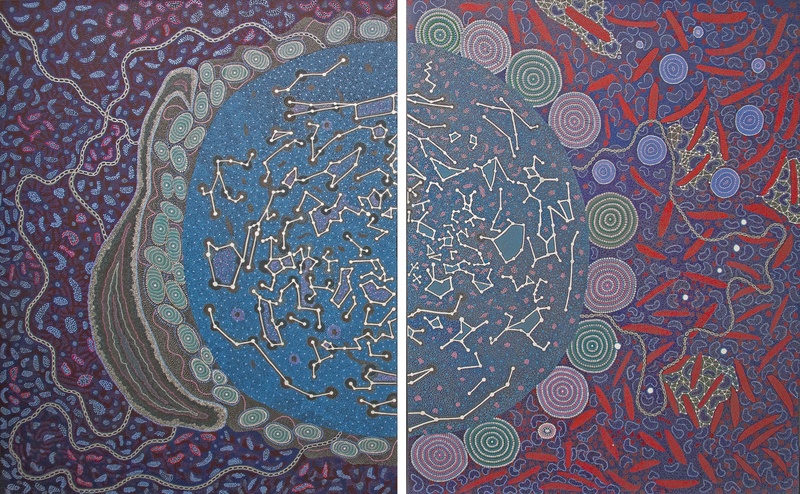 The SKA’s indigenous art/astronomy exhibition Shared Sky is on display at the Iziko South African National Gallery in Cape Town until the end of May 2015. Cape Town, Friday 13 February – After its inauguration in Perth, Western Australia in September, the SKA’s indigenous art/astronomy exhibition Shared Sky was inaugurated in South Africa today at the prestigious Iziko South African National Gallery in Cape Town. The South African Minister of Science and Technology, Naledi Pandor, officially opened the exhibition this morning in the presence of distinguished guests, officials from various embassies and the South African artists who have contributed to Shared Sky. 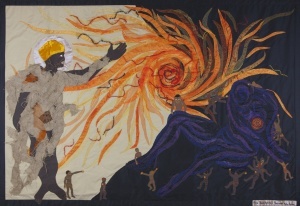 The Creation of the Sun, a collaborative quilt by South African artists from the Bethesda Arts Centre. “Shared Sky successfully reflects on the ancestral interpretations of the night sky from indigenous people from both South Africa and Australia, and it also touches on South Africa’s flagship science programmes” she said at the inauguration. 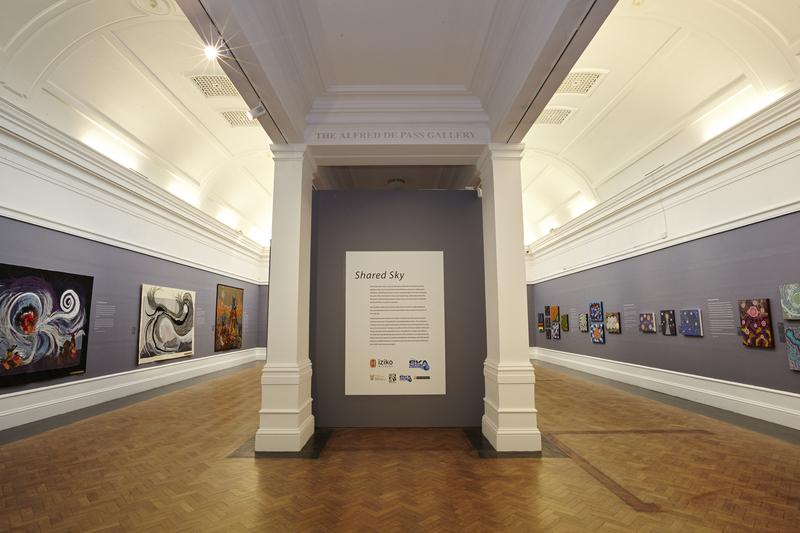 The exhibition stems from a vision by the SKA to bring together under one sky Aboriginal Australian and South African artists in a collaborative exhibition celebrating humanity’s ancient cultural wisdom. It reflects the richness of the artist’s ancestor’s understanding of the world and explores how this sophisticated understanding of celestial mechanics resonates in the work of living artists that are sharing their insights with scientists working to unlock the secrets of the Universe. “Shared Sky connects ancient peoples who have been doing astronomy for millennia & today’s astronomers. It’s just the tools that have changed” said Simon Berry, Head of Policy Development at the SKA, who represented the SKA Organisation at the inauguration. Being located on similar latitudes on both continents, the two SKA sites in Australia and South Africa present essentially identical views of the night sky to the peoples that have lived there for tens of thousands of years, creating a natural link between the two communities. 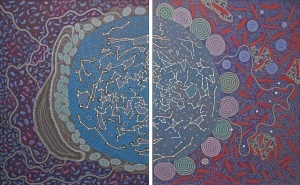 Ilgari Inyayimanha (Shared Sky) , a collaborative painting by Australian Aboriginal artists from Yamaji Art. “Through partnerships and collaborations, the SKA radio telescope project and the attendant Shared Sky exhibition bring together individuals, programmes, institutions, national departments, countries and museums. Embodied in the exhibition are advanced scientific enquiry, contemporary artistic creativity and ancient indigenous wisdom from Australia and South Africa about the universe” said Rooksana Omar, CEO of Iziko Museums, a national flagship institution and an agency of the national Department of Arts and Culture in South Africa. The exhibition is open to the public in Cape Town from 13 February until the end of May 2015, after which it will continue on its international tour. The exhibition in Cape Town has been curated by Chris Malcolm, Director of the John Curtin Gallery in Perth as international curator in partnership with John Parkington, Emeritus Professor of Archaeology at the University of Cape Town, and is presented in South Africa in collaboration with curator Sandra Prosalendis, exhibition designer Elsabe Gelderblom and Carol Kaufmann, Curator of African Art at the Iziko South African National Gallery, Cape Town. To know more about the project, visit our dedicated page on Shared Sky, and read the press release on the South African Inauguration by SKA Africa.